New-age Automation needs are changing and to stay ahead you need to have nothing but the best in Cable Technology. Whether it is for connectivity or transmission, V-Guard has emerged as a prestigious Manufacturer for availing an array of Cables befitting demanding industrial requirements. If you are looking for flat submersible cables, V-Guard is the best option for you. We offer the best quality submersible cables which comprises of all kinds of flat submersible cables. Our submersible cables are made up of the best quality raw materials which are procured from the best sources. 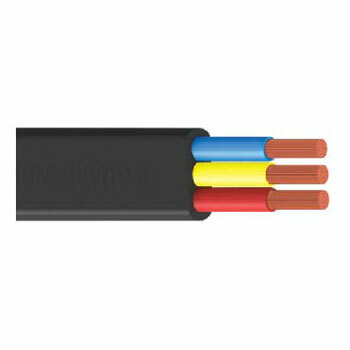 We also manufacture these submersible cables under the best quality conditions possible. Our range is available at quite an affordable price. We are one of the known manufacturers of submersible power cables. Our relentless pursuit of delivering the best quality is driven by a team of experts, which has placed us amidst the prominent Cables Manufacturers in India. Flat submersible cables are specialized cables used. As their area of installation is physically restrictive, and the environment is very hostile, we design and manufacture them, keeping in mind these factors to achieve the highest possible degree of reliability & safety. Certain striking features of Flat Submersible cables include excellent resistant to moisture, abrasion, grease, oil, longer flex life, excellent mechanical & electrical properties. Multi Core Flat Cables consist of 3 insulated cores laid side by side and extruded over it using black sheathing grade PVC. These cables are flat in nature and therefore are called Flat Cables. Cores are not laid up in this type of cables and are parallel to each other. V-Guard three core flat cables are manufactured under stringent quality control systems in V-Guard’s state-of-the- art cable factory at Coimbatore. Three core flat cables are ideally suited for heavy duty applications in industries and submersible pumps, in which the sheathing must withstand abrasion and prevent ingress of water inside. The sheathing is made of special grade sheathing PVC which gives the required finish and strength.